This is the story of a 49-year-old lady, a native of Afghanistan. She had been suffering from bloating sensation in the abdomen and a steadily increasing abdominal girth for about three years prior to been seen by me. Of and on she would also experience dull ache in the left flank. She was investigated elsewhere and found to be having a giant tumour in the abdomen. With this information I saw her at a tertiary care hospital in New Delhi, India. A review of CT scan films revealed that a large fat containing tumour had replaced the left kidney while displacing the rest of the abdominal contents towards the other side of midline. The lady had been told earlier that this was an inoperable tumour. 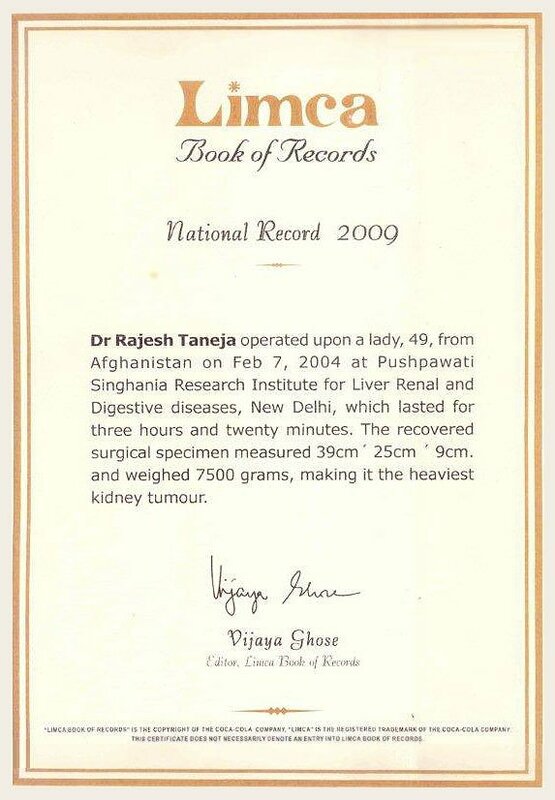 I decided to accept the challenging task and operated upon her on 7th February 2004 at Pushpawati Singhania Research Institute for liver Renal and Digestive diseases, New Delhi. The operation was conducted under general anaesthesia and lasted for three hours and twenty minutes. This is an unfortunate story of a woman whose life became miserable due to the most basic privilege of any lady of her age. While she was in labour during child birth, she did not receive adequate medical help resulting in what is technically called ‘Obstructed Labour’. In simple words, it means that the head of the unborn fetus gets stuck in the bony pelvis of the mother. As a result of this, the tissues of bladder get squeezed between the head of the fetus and the bone of the pelvis leading to ‘necrosis’ or breakdown of tissues. Consequent to obstructed labour, Mrs. S developed a hole in her urinary bladder (Vesico vaginal Fistula, or VVF) and started leaking urine continuously. She underwent three operations to close this hole in Gujarat, but unfortunately she continued to leak urine causing unabated physical and mental agony. When Mrs. S came to PSRI hospital, she was diagnosed to have what is technically termed a persistent VVF. After examination and suitable investigations, Dr. Rajesh Taneja, senior consultant Urologist decided to take up the challenge. Mrs. S underwent a tedious abdominal surgery, made difficult due to previous operations, and lasting almost 6 hours. But at last, this was the end of miseries for Mrs. S and her family. This is the story of a 19 year old boy S.D., who suffered liver failure at the age of 12 years. 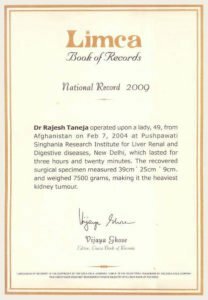 He underwent liver transplantation in 2002. Except for some initial problems after the transplant he was doing reasonably well till few months ago when he developed fever and jaundice again. He was found to have developed obstruction to the flow of bile due to formation of stones in the ducts within his liver. The ducts within his liver had become congested with pent up bile. He underwent a procedure for draining the obstructed bile, which was done by passing a thin tube from the skin into the liver under ultrasound guidance. This relieved him of his fever and jaundice, but he continued to carry a tube and a drainage bag attached to his tummy. The surgical removal of stones and correction of the obstruction was considered and discussed with the parents of the child. In view of the high risk of this operation including fatal complications, his parents did not give consent for the surgery.